The amazing run of the Royals continues tonight against the San Francisco Giants. After a 5 day layoff the team looks to continue it's 8 game winning streak. Both teams enter the World Series on a high note after exciting series's against Baltimore and St. Louis. Throughout the post season the Royals have used their amazing speed and defense to grind out win after win, look for more of the same. The Giants have had timely hit after timely hit to help make up for defensive mistakes. So, who has the advantage? The Royals seem to have the media, fans and country on their side. Everyone likes an underdog, but are they really an underdog? While fundamental baseball vanished from the game during the steroid era, it was alive and well in K.C., mainly due to financial constraints. Ironically, it is these fundamentals will lead they to a World Series championship this year. What I'm seeing is a Royals victory in game 5 or 6. We will continue to see more of the same 1 run victories and the veteran Giants will hit the same brick wall as the A's, Angels and Orioles. After gutting out two wins in Baltimore, the Kansas City Royals will have three home games to win two, and advance to the World Series. This has been a most improbable run, but the team has grown up quick. Most thought that the Royals would just be happy with making the playoffs, or beating the A's, or beating the Angels. That has clearly not been the case. The Royals should be able to continue their run with Jeremy Guthrie on the hill tonight. He has been almost as good as James Shields in games like this and there is no reason for him to not show up. If they can close out Baltimore it may be the biggest upset since the Miracle Met's, who ironically beat the O's in 1969. The Royals have really gotten the most out of their first post season in 29 years. They looked more like the New York Yankees than the Royals in dismantling the Angels. As the team moves on to Baltimore to play the Orioles anything is possible. In the playoffs deep bullpen pitching can make up for a lack of offense. Just look at what the San Francisco Giants have been able to do. So, as this series starts I expect it to be even more thrilling than the A's and Angel's games. This Royals team has shown that they will not back down. While Baltimore is just as hot of a team, I think the Royals bullpen edge will let them take this series. It may be a 7 game series, what else would you expect in this crazy Royals season. This is the thing that I hate about winning streaks in baseball. Inevitably the team comes back down to earth and things even out. For the Royals, they have followed up 10 straight wins by going 3-7. After splitting the first two games of their series with the Angels, they find themselves in almost a must win for this time of year. They really need to get back to winning series and not fluctuating back and forth with streaks. In the long run consistent play will get them back into the division lead. Yoenis Cespedes has had pretty quite year so far, but his throw last night will be one that people will talk about forever. If you have not seen this I have included a link to the video below. This guy is a true 5 tool player. It was almost unfair for the Pirates last night. Hanley Ramirez took a big step towards coming out of a season long slump by going 4-4 with 2 homers and 5 rbi's. When he is rolling, Ramirez has one of the best swings in the league. One that creates fear in opposing pitching staffs. For some reason he does hit bad stretches where some have questioned his work ethic (mostly while he was in Florida). If he can continue to raise his batting average things could go very well for L.A.
How Are The Blue Jays Doing It? Look who's at the top of the A.L. East, the Toronto Blue Jays. I'm sue most writers picked the Jays to be a last place team in this division, that's not a bad thing though, most had the Red Sox in the same position last year. To this point the only player that has had a stand out year has been Mark Buehrle, his 8-1 record has given them their over .500 record. On the offensive side of things Edwin Encarnacion and Jose Bautista are both well into double digit home runs already, but in the A.L. there are a few teams that can usually have that on their resume. The real question is if this team is built for the long haul of the season. With no other really dominate pitchers I think they are going to hit a rough patch where they won't be able to rely on offensive out bursts. We will see, remember it's still May. Zack Greinke continues to impress this year by shutting down the lowly Arizona Diamondbacks for his seventh win of the year. When this guy puts things together he can really go on streaks where he's almost untouchable. Despite all of the things that have been going on with the team, Greinke has kept his composure and really turned into a leader. We might be in for a dog fight in the west this years with most of the teams improving their roster. Any series between the Dodgers and Giants this summer will be must a must watch. If Greinke can keep up this pace he could make a real run at a 20 plus win season. Maybe another CY Young Award? Mike Moustakas finally came through with some clutch hitting today by going 2-3 with 3 rbi's. It has been a disastrous start to the year for Moustakas who is now hitting .161, It also seems like the Royals are considering other options as they have played Danny Valencia at third a number of times this year. On a positive note, the team has now started to hit. They may have gotten back on track now after it seemed like it would be another losing May. For this team to make a run though, they will need production from third base, it's a must. If Moustakas can turn things around he is their man. If not I get the sense that the team may trade for some power and a better average. Last year Eric Hosmer started off very slow and then exploded in the second half of the season. The way that he is started this year, he might be in contention for an MVP if the Royals make a run. It has been great to watch Hosmer evolve over the past few years. There were times when his swing just wasn't there and times when he lacked confidence at the plate. It is clear that he has matured and grown into a patience and pronounced presence at the plate. What makes this even better, is that he has evolved as a fielder as well. His gold glove last season may be the first of many to come. He has saved countless runs with his picks at first base. After a 8-0 blowout today, maybe the Royals can also get back to full form. Check out his 2014 Topps baseball card below. The Met's knew that they had issues at shortstop before the season, so it's no surprise that there has been very little offensive productivity through the first month of the season. Ruben Tejada has to be very close to being traded, released or sent down. Omar Quintanilla has been 'ok', but far from what the Met's need to compete. At ethis point the Met's really need to take a look at Anthony Seratelli. Seratelli is hitting .326 for AAA Las Vegas and has been a consistent minor leaguer for almost a decade (he has never played in the majors). He was also one of the last players cut at the end of spring training and showed the team that he could be productive. Seratelli may not be the Met's short stop of the future, but his energy could boost the Met's and get them back on the right track. Also, it would be a pretty cool story for this guy to finally make it to the majors. Here is a link to a great piece about his journey through the minors. It seems to be only a matter of time. Well, everyone knew that this was coming at some point. It's a good thing that it was handled early in the season because situations like this can get very ugly, especially in New York. On the flip side of things, Ike Davis was a class act and was a good Met. Looking forward, Lucas Duda will now have to prove why he won the first base job. He is off to a productive start and having Josh Satin play against lefties will help him even more. On another note, the Met's as a team really need to improve on the amount of strikeouts they have at the plate. I know Duda will strikeout around 140 times this year, but with Davis moving on the team just got ride of an additional 100 at least. The Mets Have To Be Glad To Be Out Of L.A. Boy, that series turned really ugly fast. Bartolo Colon looked like a batting practice pitcher who was selected to throw to someone in the home run derby contest. I really hope this was just a case of a pitcher going back to his old league and the team just knew him that well. Pitchers have bad days, but when thy are over 40 it makes you wonder if they have just lost their stuff. I'm glad that David Wright and Daniel Murphy showed some heart and got kicked out. If I was them I wouldn't have wanted to stick around for the rest of that game either. Things should go better for the team tonight as they face Arizona who has had an even worse start than the Mets. In the American League a strong bullpen will get you very far. Last year the Royals had one of the best ones in decades. After a slow first series to the season, the bullpen (sans Wade Davis) and the rest of the team seem to be back on track. When you had the ball to Greg Holland you can sit back, relax and make your dinner plans. This guy is in his prime and a master on the mound under high pressure situations. I'm also liking Alex Gordon batting behind Billy Butler. You can just see the better pitches Butler is now seeing. As the season progresses we will see if the numbers back this up. If the Royals can get the sweep today it would cap a great home start to their year. Just when it looked like Lucas Duda had pushed Ike Davis to the verge of trade or release, he hits an unbelievable walk off grand slam home run. Does this make the Met's reconsider their decision? Will they try to get Duda some at bats in the outfield? That being said, I think the Met's have made their decision and need to trade Davis as soon as possible. They have seen the results of a full season of Davis at first. They have also seen the troubles Duda has had hitting while playing in the outfield. So, it was good to see Davis have a great moment yesterday, but in the long run I think it's still best for both sides to move on. Interesting game last night. Jenrry Mejia looked like a young Pedro Martinez last night, both in his pitching and his intensity. If you had never watched the Met's before you would have thought that he was their ace. The game ended with even more 'Dominican mafia' flare with Jose Valverde closing the game out after allowing a few base runners. On the offensive side, Lucas Duda no doubt had confidence at the plate after being named the starting first basemen. He responded with 2 well timed home runs. Considering the poor weather, his home runs were very impressive. The rest of the team still seems to be struggling to get things going. For the Met's to be competitive they are going to have to get hits out of 1-8. Well, that didn't take so long did it? This off season seemed to go by very fast, maybe it was all of the moves and big deals that went down. You couldn't ask for a better afternoon to start off the season as well. Two games that went into extra innings, including the Pirates winning on a walk off by Neil Walker. This also may be the last time you see the Marlins and the Rockies during prime time! From what I've seen, the entire league looks ready to play. What makes things even better there are no snow outs today either. As I did last year, I will be blogging as a nationwide spectator of any and all games I want to chime in on. I will be covering the Royals and the Met's the most though. Weird combination I know, but I should e able to provide some good insight of both leagues. Here's to another season! I saw Billy Hamilton play a little bit last year when he came up and thought he was a nice throwback player. He made me think about the old Cardinal teams with Vince Coleman and company where they would get on base, move runners over and steal steal steal. Good old National league baseball. In the steroid era speed was a forgotten tool in the game. Why try and steal a base when everyone is hitting 30 plus homers right? Teams like the Giants have really bucked that trend as of late and it looks like the Reds are going in the right direction. Below is a link to a nice piece on Hamilton where he talks about his commitment to the bunt. I've always went by the old adage of "if you can't bunt, you can't hit"
We are only about a week into the season but from what I have seen the Royals are pretty quick out of the gate. I guess it should be expected that a team that finished strong last year would be eager to start off well in the spring. Over that past two years it has been slumps early in the season that have really hurt the Royals. Last year it probably kept them out of the playoffs. 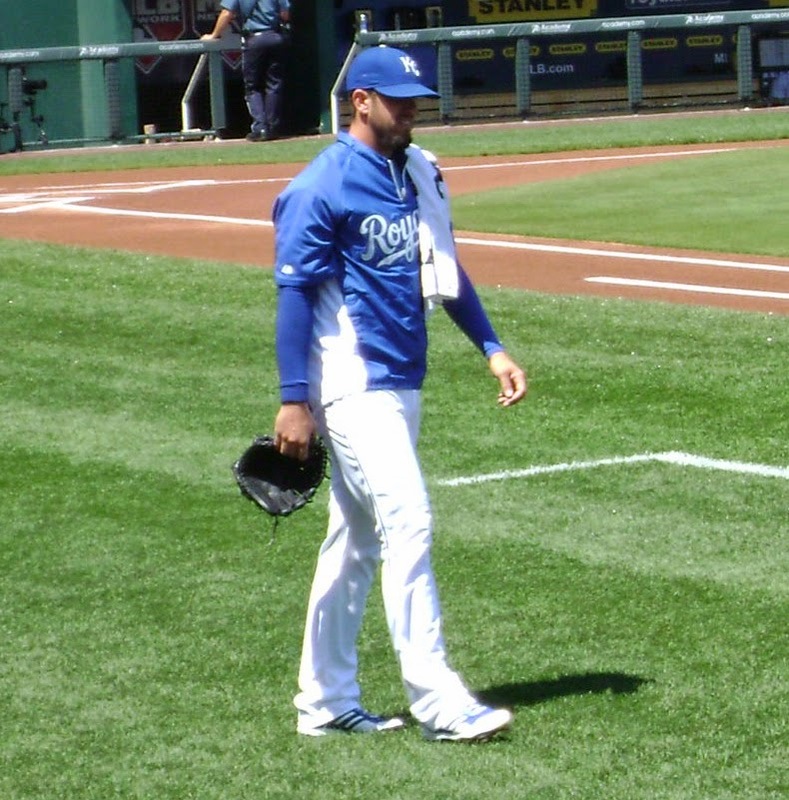 There is a link below to a good piece on Alex Gordon not being satisfied with his hot start. I know it's only one spring training game against one of the weaker teams in baseball, but it was great to see Curtis Granderson show his home run stroke this early. This year the Met's just need Granderson to play his game. He can hit .250 as long as he gives them around 40 homers and 100 rbi's. I was also impressed with the pitches that he hit out and the fact he hit one off of a lefty and a righty.The real winner in the end will be David Wright, having a big bat in the lineup with him again will allow him to get back to where he was a few years ago. When Wright was at his best you have to remember that he had Carlos Beltran and Carlos Delgado in the lineup with him. Duda Or Davis At First Base? Having watched the first few games of spring training I can already tell that the battle between Ike Davis and Lucas Duda is going to be a close one. Both players have already gone deep this spring with impressive long bombs. Both look to be in great shape. So what will set these two apart? There is a thought that it may come down to Davis having the better glove. This is a big advantage that is also inline with the Met's scheme of things. But do his defensive numbers off set the big slumps that he seems to go through each year? Looking at Duda's numbers they have been pretty consistent, and knowing what your are going to get each day at the plate can be invaluable. Hard to choose right? Taking a look at Davis's swing it pretty much looks the same. There is an obvious hitch that he refuses to change. He seems to control the hitch for spans of time, 1 month, 2 months or even most of one season. Looking back I'm thinking that pitchers around the league have his number. This credit, he has been able to be a little bit more productive by swinging at better pitches. Will this be enough for him to be productive? I'm not going to bank on it. As for Duda, I like the true power and contact that he can provide a team. I'll also add that not having to worry about playing in the outfield will help him concentrate at the plate. There is just something that I like about Duda's swing and approach at the plate. I think that giving him confidence and letting him shine, he will finally break through and have a huge season. You see players with a similar path have big years, usually it's with another organization after being traded. It's great to see a player that knows its time to go, but would you expect any else from Derek Jeter? Having announced that 2014 will be his last year this week, Jeter will allow fans to say goodbye in an awesome farewell tour. Stuff like this is good for baseball. Along with increased ticket sales at every stop the Yankee's make this year, it gets people excited about the history of the game and looking back over a body of work. Jeter was a once in a lifetime talent and another iconic Yankee. The Yankee's may have to wait a decade to find another star like this. For now, fans should just sit back and enjoy watching one of the best wind down his career. Hopefully he can finish healthy and with a descent batting average. I'm sure he will have no problem making the all-star team, but MLB should make sure he is added to the squad in his final campaign. Below are a few stories on Jeter's announcement. Back in the mid 1980's I had the great luck of having WOR on my cable system in Omaha, NE. Lucky because I was able to learn the game of baseball from Ralph Kiner and Tim Maccarver. With Kiner's passing it has given us all a chance to reflect on what makes the game of baseball great. The personalities around the game and its history is what separates baseball from other sports. Kiner made the games that I watched fan by sharing everything he knew about the sport. Below I have included a few tributes and clips from Kiners career. Will always I miss Kiner's Korner! For once the Super Bowl pairs the two best teams from the regular season. While it was expected for the Denver Broncos to be here, the Seattle Seahawks have finally passed the likes of the 49ers and the Saints to reach the big game again. There are two obvious things to look at in this match up. First it is the match up of the best offense in the game against the best defense. You also have drop back quarterback versus mobile improviser. And just to make things interesting there is a possibility of snow! So who will have the offensive advantage? Peyton Manning may be the best quarterback of all-time and he has a very talented group of receivers on his team. On the other side, the Seahawks defense, their defensive backfield in particular, seem to be up to any and all challenges. While Manning might be able to see the field and make good decisions, the pure athleticism and awareness the Seahawks have may give them a good shot to shutdown the Broncos. The key for Denver will be getting a running game going. This is one area where the 49ers lacked, and Manning will not run for as many yards as Colin Kaepernick. On to the quarterbacks. Russell Wilson has already exceeded expectations as an NFL player. Having seen his game in college I will say that he looked like someone who had a great college career, but maybe wasn't the type that transferred into a pro one. Even though he has kind of let the defense lead the team during the playoffs, he has still shown he can make big play after big play by staying alive in the pocket. That being said, there is only one Peyton Manning. To win the quarterback battle Wilson will need to play his game and not get caught up in the moment and make a mistake. I think he should use his legs to get first downs and leave it all out on the field. So whats the weather gonna be? There has been speculation that there will be snow since this Super Bowl was announced. As we get close to the game it looks like there will be snow in some sort of form. It does not look like it will be a blizzard though. I think in a game like this the weather will not make a difference. Both teams will be focused on winning a championship. If there is an edge, I would say the Broncos would have it. They play and practice in the Rocky Mountains! Update: Well it does not look like its going to snow. I still like the points on this one. Does Tanaka Bring The Yankees Back? So, the New York Yankees have once again won the battle of throwing money at a foreign player. Masahiro Tanaka was going to probably end up in New York no matter what though. When an ace knows he's and ace he will pick the place that will best show off his skills. His 24-0 record last year is almost mythical now, and I'm sure Yankee fans are already talking world series. I'm a little more bullish on the Yankees after this signing, but there are 4 other people that pitch between Tanaka. This team is also very old and does not have much speed. I think what this signing does is appease the fans and gives the team a big off season win. Don't get me wrong, I will be watching this guys first few starts and if he has 24-0 stuff over here I will be watching him every time he steps on the mound. It may be tough to go undefeated without Mariano Rivera though. It's surprising to me that there are so many good pitchers left as we approach spring training. The first thing that you hear from most GM's is that they would like to pick up a good starting pitcher in the off-season. Well, there are plenty of good ones left. Ervin Santana, Bronson Arroyo and Matt Garza top out the list of quality starters that are available. Any one of those arms could be key to a team making a playoff run, so it's even more surprising that a team like the Red Sox or Yankees have not snagged one of them yet. Looking at each of these guys they are also pretty reliable as well. My thought is that they maybe holding out for the best bid and teams are not biting. It;s hard to imagine that these guys will be free agents much longer. We will see how long each pitcher lasts on the market. Sometimes it's just a waiting game. Tomorrow the baseball writers of america will release the voting for the hall of fame and this could be a big class. Early indicators are pointing to Greg Maddux, Tom Glavine and Frank Thomas making it. Mike Piazza may come up just short as polling has showed him around 72% (75% is needed). I think that the top three a shoe in's and that Piazza will be left out due to some allegations swirling around his career. The hall might just want to make sure that a 100% clean class makes it in this year and I don't blame them. For more info on the unavailing event tomorrow check out the link below. Tell me what you think will happen.